Is your mom the sweetest? 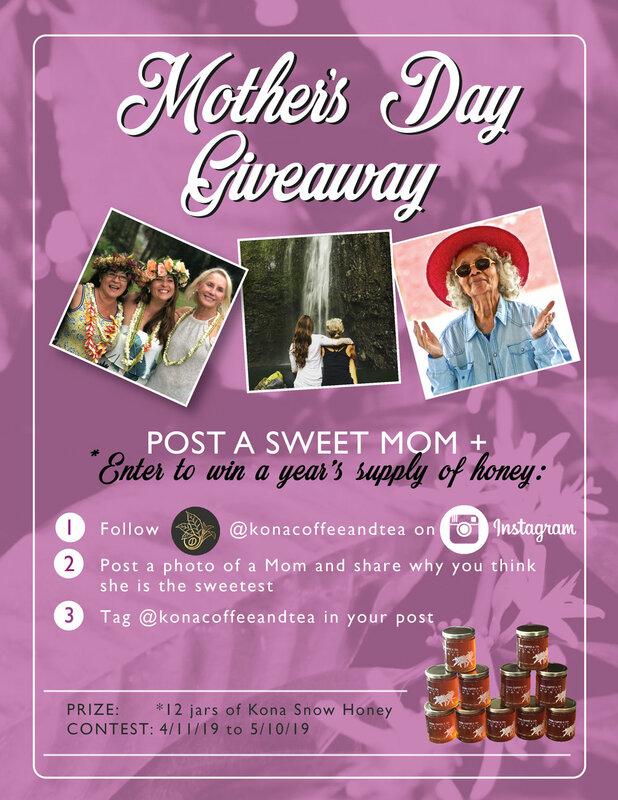 Show your Mom some love and be entered to win a year’s worth of honey from Kona Coffee & Tea. We’re having a Mother’s Day Giveaway on Instagram to celebrate all the sweet Moms out there. Show us who your queen bee is this Mother’s Day! WHO: Any legal U.S. resident age 18 or older may enter. WHAT: Following the steps above will enter you to win 12 jars of 12oz Kona Snow Honey. WHEN: The contest begins at 12:00 a.m. Hawaii Standard Time (HST) on 04/11/19 and ends at 9:00 a.m. HST on 05/11/19. The winner will be announced on Friday, 5/11/19. WHERE: On Instagram. You can download the app for free from any smartphone app store. In celebration of Mother’s Day, one lucky winner will win a year’s worth (12 jars) of Kona Snow Honey. The following is intended for viewing in the United States and D.C. only (including territories, possessions, and commonwealths) and will be construed and evaluated according to United States laws. Do not proceed in this site if you are not a legal resident of the U.S. or D.C., 18 years or older, and accessing this site in the United States, its territories, possessions, or commonwealths. OFFICIAL RULES – NO PURCHASE OR ONLINE ENTRY NECESSARY TO ENTER OR WIN. A PURCHASE WILL NOT INCREASE YOUR CHANCE OF WINNING. 1. Eligibility: The Kona Coffee and Tea Company’s Mother’s Day Giveaway (the “Contest”) is open only to legal residents of the fifty (50) United States and the District of Columbia who are at least eighteen (18) years old or older (or the age of majority in their state) at the time of entry. The Kona Coffee and Tea Company (Sponsor), as well as the immediate family (spouse, parents, grandparents, siblings, grandchildren, and children) and household members (whether related) of each such employee, are not eligible. The Contest is subject to all applicable laws and regulations and is void where prohibited. 2. Sponsor: The Kona Coffee and Tea Company, also known as Kona Coffee & Tea. 4. Timing: The Contest begins on 11 April 2019 at 12:00 a.m. United States Hawaiian Standard Time (“HST”) and ends on 10 May 2019 at 8:00 a.m. HST (the "Contest Period”). Please see world clock for time zone information. Entrant is responsible for determining the corresponding time in entrant’s location. Please see world clock www.timeanddate.com/worldclock for time zone conversion information. Administrator’s computer is the official time-keeping device for the Contest. Limit: Each entrant may enter one (1) Submission by following @konacoffeeandtea on Instagram, posting a photo and caption, and tag @konacoffeeandtea in the post. The "authorized account holder" is the natural person assigned an Instagram account. Each entrant may be required to show proof of being an authorized account holder. Released Parties (as defined in Section 9, below) are not responsible for lost, late, stolen, damaged, incomplete, invalid, un-intelligible, garbled, delayed, or misdirected Submissions; all of which will be void. 6. Winner Determination: After the conclusion of Contest Period, a Winner will be chosen by the Prize Administrator. 7. Winner Requirements: The potential winner will be notified via direct message on Instagram on or around 11 May 2019. If a potential winner cannot be contacted, does not comply with these Official Rules, or if prize notification is returned as undeliverable, potential winner forfeits the prize. If a potential winner is disqualified for any reason, the prize may be awarded to the next randomly drawn contestant, if any, in Sponsor’s sole discretion. 8. Prize: The winner’s prize is 12 jars of 12 ounces of Kona Snow Honey. By accepting ticket prize, winner agrees to abide by any terms, conditions and restrictions provided by the ticket. Approximate Retail Value (“ARV”) of prize: $180 USD. For All Prizes: Prizes are non-transferable, not redeemable for cash, non-negotiable, non-refundable and no substitution will be made except as outlined above or provided herein at the Sponsor’s sole discretion. Sponsor reserves the right to substitute a prize (or a component thereof) for one of equal or greater value if the designated prize should become unavailable for any reason. Winners are responsible for all taxes and fees associated with prize receipt and/or use. Limit: One (1) prize per person. 9. Release: By receipt of any prize, each winner agrees to release and hold harmless the Sponsors, Administrator, Prize Administrator, and their respective parent companies, subsidiaries, affiliates, suppliers, distributors, advertising/promotion agencies, and prize suppliers, and each of their respective parent companies and each such company’s officers, directors, employees and agents (collectively, the “Released Parties”) from and against any claim or cause of action, including, but not limited to, personal injury, death, or damage to or loss of property, arising out of participation in the Contest or receipt or use or misuse of any prize, including any related travel. 10. Publicity Acceptance of any prize shall constitute and signify each winner’s agreement and consent that Sponsor and its designees may use the winner’s name, city, state, likeness, photo, and/or prize information in connection with the Contest for promotional, advertising or other purposes, worldwide, in any and all media now known or hereafter devised, including the Internet, without limitation and without further payment, notification, permission or other consideration, except where prohibited by law. 11. General Conditions: Sponsor reserves the right to cancel, suspend and/or modify the Contest, or any part of it, if any fraud, technical failures, human error or any other factor impairs the integrity or proper functioning of the Contest, as determined by Sponsor in its sole discretion. If terminated, Sponsor may, in its sole discretion, determine the winners from among all non-suspect, eligible Submissions received up to the time of such action using the judging procedure outlined above. Sponsor, in its sole discretion, reserves the right to disqualify any individual it finds to be tampering with the Submission process or the operation of the Contest or to be acting in violation of the Official Rules of this or any other promotion or in an unsportsmanlike or disruptive manner and void all associated Submissions. Any attempt by any person to deliberately undermine the legitimate operation of the Contest may be a violation of criminal and civil law, and, should such an attempt be made, Sponsor reserves the right to seek damages and other remedies (including attorneys’ fees) from any such person to the fullest extent permitted by law. Sponsor’s failure to enforce any term of these Official Rules shall not constitute a waiver of that provision. All Prizes are awarded “AS IS” and WITHOUT WARRANTY OF ANY KIND, express or implied (including without limitation any implied warranty of merchantability or fitness for a purpose). 12. Limitations of Liability: Released Parties are not responsible for: (a) any incorrect or inaccurate information, whether caused by entrant, printing, typographical or other errors or by any of the equipment or programming associated with or utilized in the Contest; (b) technical failures of any kind, including, but not limited to malfunctions, interruptions, or disconnections in phone lines or network hardware or software; (c) unauthorized human intervention in any part of the Submission process or the Contest; (d) printing, typographical, technical, computer, network or human error which may occur in the administration of the Contest, the uploading, the processing or judging of Posts the announcement of the prizes or in any Contest-related materials; (e) late, lost, undeliverable, damaged or stolen mail; or (f) any injury or damage to persons or property which may be caused, directly or indirectly, in whole or in part, from entrant’s participation in the Contest or receipt or use or misuse of any prize (including any travel/activity related thereto). Released Parties are not responsible for misdirected or undeliverable Submissions or for any technical problems, malfunctions of computer systems, servers, providers, hardware/software, lost or unavailable network connections or failed, incomplete, garbled or delayed computer transmission or any combination thereof. Released Parties are not responsible for any unauthorized third-party use of any Submission. 13. Disputes: Except where prohibited, each entrant agrees that: (a) any and all disputes, claims and causes of action arising out of or connected with this Contest or any prize awarded shall be resolved individually, without resort to any form of class action, and exclusively by the United States District Court of Hawaii (b) any and all claims, judgments, and awards shall be limited to actual out-of-pocket costs incurred, including costs associated with entering this Contest, but in no event attorneys’ fees; and (c) under no circumstances will entrant be permitted to obtain awards for, and entrant hereby waives all rights to claim, indirect, punitive, incidental and consequential damages and any other damages, other than for actual out-of-pocket expenses, and any and all rights to have damages multiplied or otherwise increased. All issues and questions concerning the construction, validity, interpretation and enforceability of these Official Rules, or the rights and obligations of the entrant and Sponsor in connection with the Contest, shall be governed by, and construed in accordance with, the laws of the State of Hawaii without giving effect to any choice of law or conflict of law rules (whether of the State of Hawaii or any other jurisdiction), which would cause the application of the laws of any jurisdiction other than the State of Hawaii, USA.